Review by AllTheBestFights.com: 2018-07-22, good finish between Mauricio Rua and Anthony Smith: it gets three stars (UFC Performance of the Night). The black belt in Bjj, former Pride Mw and Ufc light-Hw champion Mauricio Shogun Rua entered this fight with a professional mma record of 25-10-0 (84% finishing rate) but he is not ranked as he hasn’t fought since March 11, 2017 when he defeated Gian Villante (Mauricio Rua vs Gian Villante). Before this bout he had suffered two consecutive losses in 2014, against Dan Henderson (Shogun vs Henderson 2) and Ovince St Preux (Shogun Rua vs St Preux), but then he has won three bouts. His opponent, Anthony Smith, has an official record of 29-13-0 (90% finishing rate) and he entered as the No.11 light heavyweight in the world. He has already fought twice in 2018 losing to Thiago Santos (Thiago Santos vs Anthony Smith) and beating Rashad Evans. 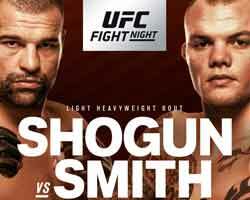 Shogun vs Smith is the main event of UFC Fight Night 134. Watch the video and rate this fight!